Holašovice Historic Village is a historic rural village which has preserved its typical vernacular architecture from the 18th and 19th centuries. From the 16th century on, settlers from Bavaria and Austria arrived. They brought with them the tradition of masonry building for domestic structures. 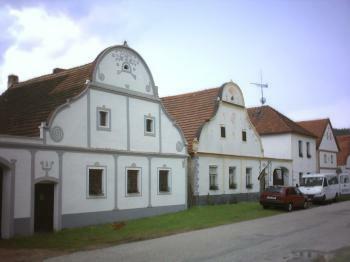 The village was deserted after the Second World War, allowing its medieval plan and vernacular buildings in the South Bohemian Folk or Rural Baroque style to remain intact. It was restored and repopulated from 1990. Holašovice Historic Village is a tiny WHS in the south of Czechia. Six previous reviewers on this website have already tried to capture its Outstanding Universal Value - often in vain. 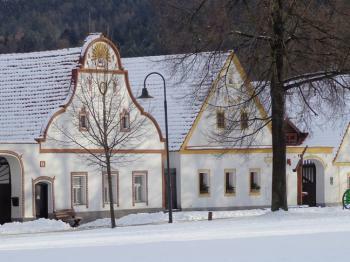 Its value lies in its architecture (the fusion of two vernacular building traditions into "South Bohemian Folk Baroque") and being an authentic representation of a Central European rural settlement. It also has been considered as a continuing cultural landscape, but that part seems to have been disregarded at inscription. Less than a week after I was in Egypt, with temperatures reaching 40 degrees Celsius in Abu Simbel, I found myself at a completely different scene. Holašovice lies in a hilly area full of farm villages. There was still snow on the ground. The closer I got to Holašovice the snow cover got thicker and it started raining as well. I had some trouble finding the town actually – I had to navigate via my smartphone, as there is no signposting. 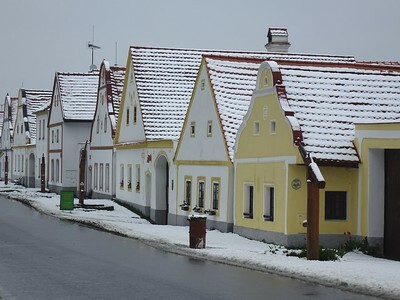 On the way I passed at least two village centers similar to Holašovice, with a pond and a row of colourful houses. Despite its unassuming surroundings, Holašovice is ready to receive tourists. At the edge of town there’s a parking lot large enough for a tour bus or 2. They also have an information center and a museum. And a monument celebrating the inscription on the World Heritage List. A minibus with some Asian tourists was just leaving when I arrived – the last passengers were running around to have some quick final shots of the village. One of the characteristic spots in the village is the large pond in the center, but I could hardly see it because of the snow. All I could do was to take a brisk walk round the elongated square. Although the façades of the buildings that surround it have nice colours, they give away nothing about what lies behind their gates. None of the protected buildings except for the museum are open to the public. Which is understandable as people still live there. But it makes it hard to understand what exactly is so special about these farmhouses. If you want to prepare your visit in depth: more background info is available in this pocket guide. Farmhouse number 6 holds the small "museum" - perhaps one could better say that the farmer exhibits his old items in a barn to earn something extra. Its opening hours may be erratic, but I was let in after ringing the bell. The owner of the house proceeded to give me an extensive explanation in English about each object. Later we talked about the weather ("this is not normal") and about the Netherlands (good country, he had been there a few years before). The biggest advantage of visiting this museum is that you can see how the traditional farmhouses are set up: through the gate you arrive at a courtyard, with to the left the house and behind it the stables and sheds. In front of nearly every house stands a wooden pump, which was used to pump water by hand through pipes into the building. There might be some interesting piece of local history connected with the pumps, but I did not get to the bottom of it. Overall I lasted 25 minutes in town, my visit cut short because of the cold. On the way from Prague to Cesky Krumlov, the small World Heritage Site village of Holasovice was an easy stop for a brief visit. I drove pass many nice villages which I really enjoyed but noticed that all of them had many architectural styles from Baroque to modern, a sign that those villages have developed thru time, so I questioned myself how possible Holasovice be perfectly preserved? I parked my car in the designated almost full carpark behind closed tourist information center, presumed that from the size of the carpark for about 20 cars, the village is enjoyed considerate number of tourists. The whole village was very small and built around the large oval pond garden. The picturesque colorful façades of farm houses around the garden was a lovely sight to see for its unbelievable harmonious design. I felt that Holasovice was a rural version of Telc, another World heritage Site that well known for its beautiful façade buildings around its central square. Some houses were opened as café and museum, nothing remarkable for the museum display unless you were some pure city dwellers who never experienced on farm tools. The most remarkable thing I found from Holasovice was its unfortunate history which caused the whole village to be perfectly preserved. From many plagues to post WWII expulsion, the village was deserted many times and was left behind without any development unlike its nearby villages until 1990! Because of its small size, I spent less than 30 minutes to see all the must see of this village, the place’s architecture was beautiful and really a nice place to visit briefly. Its perfect condition of preservation was truly a tragic miracle which I happily that it was listed by UNESCO to ensure its future, but when I saw the sign of the nearby Stonehenge Holasovice next to the historic village, some kind of cheap tourist trap development to lure tourist money, I started to concern Holasovice’s future that even UNESCO cannot help. 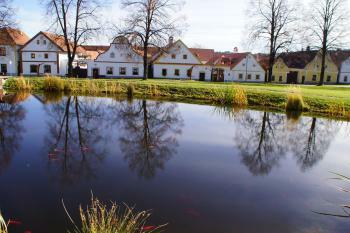 As stated by others, there isn't much to do or see in Holasovice apart from walking once around the fish pond. It's listed as a typical example for a peasant village of the time. And I think it's a fine choice. I was travelling in winter and wasn't able to figure out when a bus would run. I also had limited time, so I got a cab (fixed price) to take me from Cesky Budejovice to Cesky Krumlov via Holasovice. Price was very reasonable. Scenery was great with snow everywhere. And even though I don't speak Czech me and my cab driver had quite some fun on the road. Very nice memory. The closest WHS is Cesky Krumlov. As stated this can be combined into a day trip. Cesky Budejovice is quite nice. Drinking a REAL Budweis beer in the REAL Budweis brewery a great treat. In October 2013, we spent a long weekend in Ceský Krumlov, we travelled by car and thus it was easy to visit also the nearby Holasovice. Just like the previous reviewers, I would not have visited Holasovice, if it were not a WHS. But we were pleasantly surprised, pretty houses with decorated gables around the village pond and a small chapel. Everything is very well kept, but it does not look like a museum, it seems to be a lively little village. We walked around for half an hour or so, which is enough to properly visit the site. And to be honest, I spent a good part of the time taking pictures of the reflections in the pond from different positions and angles. After a cup of coffee we went on to our final destination Ceský Krumlov. Certainly, this kind of WHS is not my favorite, but Holasovice deserves to be on the list, it is a fine example of vernacular architecture. Holasovice is a small vilage in Southern Bohemia. The site itself is very small so your visit won't take long. Architecture is very nice and it is visible that the locals are taking care about their visit. I am just not sure if there would be any visitor if this village is not an WH site. I recommend to enjoy local food in one of the restaurants and local czech (!!!) beer called Budvar. Southern Bohemia is one of the nices part of Czech republic so there are many other locations for visit, so take your time. Another WH site is 20 km south - Cesky Krumlov. Holasovice has been on my to-do list for a while, but to be honest, if this place were not on the WH list, hardly anybody would ever go there. It´s really very, very small, just a village green, a fish pond, a chapel, and some houses, all well preserved and tidy, to be sure, but World Heritage material? UNESCO says it´s a representative example of South Bohemian folk Baroque..., well, I´m no expert, but why is there no example of, say, East Moravian folk Baroque on the list, then? It just doesn´t seem to be that remarkable. If you come on a weekend, it´s not very easy to reach, either, since there seems to be only one bus a day from Ceske Budejovice (Budweis). Taking a taxi is a pricier, but more comfortable option, since you can tell the driver to wait all the ten minutes it takes you to see everything (and I mean, really everything) without having to wait an eternity for the next bus. If you are not into WH sites or South Bohemian folk Baroque, skip this one. This is a quaint little village seemingly untouched by the modern European world around it. It is a decent place to visit if you have a few hours to kill on your way to/from Èesky Krumlov or Èesky Budejovice. From the later it is about a 45 minute bus trip from the central bus station, located opposite the train station. 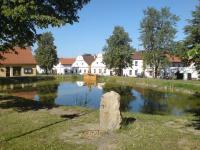 The village is basically four rows of houses around a green with a little pond and very very small chapel. All of the buildings are built in the Bohemian Folk Baroque style and are pretty nice to look at. Two of them have pub/ café’s in them so provide you with a bit of entertainment whilst you wait for the next bus. They seem to be scheduled to give you about an hour in the village, which to be honest is more than enough time as there is not much to see at all. I very much doubt I would have visited if it were not for it being another site to tick of the list. Whilst it is not exceptional it is well preserved example of vernacular architecture, something which is mostly over looked in Europe in favour of more monumental sites. Overall it makes a nice day if teamed with a few hours in Èesky Budejovice which should include a trip to the Budvar (Original Budwiser) brewery which has a fantastic and really cheap restaurant. From "Holašovice Historical Village Reservation" to "Holašovice Historic Village"
Name changes: From "Holašovice Historical Village Reservation" to "Holašovice Historic Village"
145 Community Members have visited.